Gathering from the Grassland: A Plains Journal, is my most recent prose book. With publisher Nancy Curtis of High Plains Press in Glendo, WY, I’ve been working on it for several years. In order for me to get copies of the book as soon as it was printed, we agreed to meet in Lusk, Wyoming, between our two ranches. We’d have lunch at The Pizza Place, and catch up on our personal and professional news. She’d hand over my author copies– 5 clothbound and 5 paperbound– and we’d discuss how we will each encourage sales of the book in the coming months. Many publishers, large and small, don’t do much promotion. High Plains Press supports its authors in dozens of ways, including buying lunch in Lusk– the New York City of our neighborhood. So “One Misty, Moisty Morning,” as Schooner Fare puts it, I loaded a handful of CDs, jugs of water, a rain coat and coffee. With Bob Seger, I declared at the top of my lungs that I was headed for “Katmandu;” If there’s a good song about driving to Lusk, I haven’t found it, but I won’t be surprised if this post generates suggestions. When Jerry and I lived in Wyoming, I drove five and one-half hours from my ranch to Cheyenne regularly, but since we moved to my ranch home, my trips have been rare. So I was delighted to hum a “Prairie Lullaby” (Stephanie Davis) as I headed “Beyond the Horizon” (Bob Dylan.) Since I’ve made this drive hundreds, if not thousands, of times, I knew I’d see familiar scenes, but would also surely see the unusual. And the Wyoming breezes– “Four Strong Winds” from all four directions– would keep me alert. And there I got a surprise: two bicyclists! Each wore a helmet, and a skintight outfit striped in bright colors; their panniers bulged. Heads down, oblivious to the “Thunder on the Mountain,” (Dylan) they were headed west. Just how much did they know about the arid country ahead of them? From Edgemont, it’s almost sixty miles to Newcastle, and almost seventy to Lusk, WY. There are no towns or settlements along the route, and most of the ranch houses are a considerable distance from the highway. At Mule Creek Junction, 21 miles west of Edgemont, a rest area offers water and “rest,” but little else. As I accelerated past them– not in the “Mercedes Benz” Janis was warbling about– I tried to visualize what the bicyclists might be seeing. That “Peaceful Country” (Murphey) looks spectacular from that high plateau: down toward the tree-lined Cheyenne River and Beaver Creek drainages. Silver-blue sage sweeps up the hills, and many of the gullies are jagged and deep. With their heads down, would the riders see anything but their feet and the pavement? When I drove this route nine years ago, I often thought of Murphey’s “Hardscrabble Creek” as my eyes followed ranch roads winding from the highway into the distance beyond the sagebrush. Often a beat-up car or pickup was parked beside the gate. I knew if I got into that vehicle, I’d find the keys under the floor mat or behind the visor, where ranchers always leave them. The transportation wasn’t abandoned, but meant the family had a child of school age who drove to the highway to be picked up by the school bus headed for Newcastle or Lusk. Is the ranching population aging? I saw few vehicles beside the ranch roads on this trip. In Lusk, I parked on the wide street in front of The Pizza Place, and chose a booth that allowed me to see the front door while I wrote in my journal. When Nancy arrived, we enjoyed our visit and our pizza, noticing as the place filled with folks headed to a local funeral, or just having lunch in their work day. Then we explained to one of the waitresses that we’d like to keep using the booth awhile to sign books. “No problem,” she said, and we started lugging boxes of books in from the car. Once in a while after that, a waitress would peek around the corner, but they left us alone for more than an hour as I signed books, and smiled when we refilled our water and tea glasses. After I’d signed books Nancy will have on hand for customers who ask, we transferred the boxes of books I’d bought at my author discount to my car, so I could head home and begin selling them. One of the most pleasant features of Lusk is those wide streets: two women with boxes of books could move safely from one car to the one behind it without being run over by a semi-load of hay. “Everyone says that,” she said firmly, “but I am not wearing Crocs. I am wearing Periwinkle Patent Leather clogs.” Publishers have to be precise. Independent authors and publishers need to “Try Just a Little Bit Harder,” and I promised to do so as I sang along with Joplin’s throaty vocals, accelerating out of town. Wyoming highway officials, among whom Jerry used to be numbered, know the hazards of this two-lane highway that winds through the sagebrush. They’ve thoughtfully placed rumble strips—corrugated asphalt that make a terrible racket when your tires hit it–on both edges of the highway, AND in the middle. The purpose is to wake up dozing drivers, or perhaps alert those who are texting. I noticed them first when they were applied to Highway 79 that goes past my house. Before sunrise, when I’m still trying to sleep, a truck hitting the rumble strips sounds like a helicopter landing on my bed. Rumble strips and cattle or sheep that climb through fences to graze the right-of-way aren’t all that keeps a person alert on this highway. I heard a Whoosh! as another “Greenie”—Wyoming slang for speeding Colorado cars with green license plates–raced past in a no-passing zone. I slammed on the brakes to let the idiot pull in front of me seconds before he would have been obliterated by an oncoming truck. I was angry, but I put on my “Secret Smile,” (Murphey) satisfied with being a life-saver. In the past, I may have exceeded speed limits occasionally, but no longer. I’d rather “Give A Little Bit Back” (Davis), relax, enjoy the scenery, and arrive safe and alive at home. My first published book, in 1987, was a diary of a year on my plains ranch. Windbreak: A Woman Rancher on the Northern Plains was published by a small publisher, Barn Owl Books, and featured my observations of the work and life I was leading then. Over the years hundreds of readers wrote to me with thanks for letting them see ranch life. Now, thirty years later I’ve published another book in journal form: Gathering from the Grassland: A Plains Journal (High Plains Press, September 2017). Much has changed in the intervening decades, especially because I am no longer involved in the daily chores of raising cattle. A central part of this journal is my research into the diaries and records left by my ancestors on this ranch on the plains. ​I learned things about my relatives, their history, and this land that I never knew. I’m more convinced than ever that it’s essential for us to tell our stories, not only for our blood descendants, but for those who will come after us in this world. Write for your children and grandchildren so they will know how you survived this life, and write for yourself. High Plains Press is offering a special limited-time discount for early orders. If you order directly from High Plains Press by September 20th, you’ll get a $5 discount on the limited edition hardcover. Click on the “order now” button for the limited edition hardcover. Be sure to use the comment box if you would like a personalized inscription beyond my signature (for instance, “Happy Thanksgiving, Aunt Nellie”) in any of the copies you purchase. Enter the voucher/coupon code LINDA. Click on the “recalculate” button to update the amount due, then proceed with your payment. Writers complain about editors as reliably as the sun also rises. Here’s my secret: how I learned to be happy in a world full of editors. No obligation. No guarantee, 90-day or otherwise. If you are overcome with gratitude, I will accept gifts. Once upon a time, I’d write an essay and revise it ten times, thirty times, maybe forty. Then I’d send it off to a magazine. And wait. And wait. Months or years later, I’d receive comments that the editor had jotted down in five minutes, including reading time and making herself a martini. I’d pore over the scribble for days. Even doctors write more legibly than editors, most of whom are too young to have learned penmanship by drawing millions of OOOs on a Big Chief tablet as I did. Once I knew what the editor had said, I’d smack myself with The Compact Oxford English Dictionary until the ideas began to make sense. Then I would revise the essay exactly as the editor suggested, and send it back to her. Invariably, her next set of observations would contradict the first. 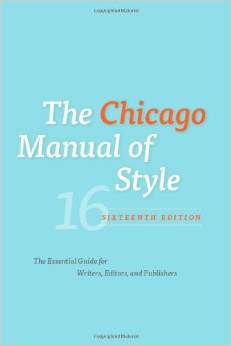 I’d swear and throw The Chicago Manual of Style, narrowly missing my faithful dog. To express slight annoyance, toss a thesaurus; reserve the forty-pound Manual for expressing serious fury. Still, following the editor’s suggestions, I’d revise again. Thus for many years I humbly followed the advice of every single editor who deigned to supply it in my Self-Addressed, Stamped Envelope, returning the revised piece until the editor rejected it. When–and if–the essay was accepted elsewhere, I noticed that the accepted version often resembled my first submitted draft written years before. Meanwhile, I noticed that I was getting older, and editors were getting younger. If we talked, many would burble, “Oooh, I just graduated from The State University of South Iowindialabama.” Several had never heard of the Chicago Manual. Gradually, I stopped believing that editors are giants in the earth, though I understand that, like most writers, I learn something every day from a writer or editor. But these days, when an editor rejects my latest masterpiece, I don’t snarl and howl. I remember that not all editors are equal. The minute I spot that rejected manuscript in the mailbox, I start my deep breathing exercises. 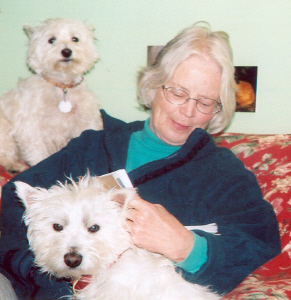 Whistling to my West Highland White Terriers, I head for my reading chair. Short dogs with thick necks and skulls, Westies are endowed with almost as much self-esteem as the average teenager, and with considerable more justification. They gallop into the room and sit, tails straight out behind them, heads tilted, gazing at me with big brown eyes, pink tongues dribbling. Closing my eyes, I inhale and visualize the editor sitting beside them, pink tongue lolling. I remind myself that I love the dogs in part because they think I am a better person than I know myself to be. I open the envelope. Few editors can leave a line of manuscript unmarked. 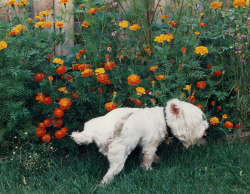 Frodo the Westie marking his territory the way some editors mark up a manuscript. Reminds me of the way The Bad Breath Boys behave on our rambles in the park. They lurch from side to side, sniff, yark, pee, yipe, pee, snort. Hmm, better sniff that again, yep, needs more; another squirt. Intent on making their mark on every foot of territory, they are one with the trees and rocks, one with the Great Leveling Moment of Peedom, unconscious of anything else in the universe. They don’t know their lives are short, don’t remember doing the same thing in the same place yesterday. Or maybe they think it needs doing again. Just like an editor invading the brave new world of a manuscript. No use telling the dogs they are minor characters, that their comments on tree trunks will be covered by the memoirs of the next leashed canine. Like many editors, they have no concept of the forest, because they are too busy demonstrating that this tree is theirs. And this tree. And that bush. When I let the dogs inside in wet weather, they ignore my pleas to wait on the rug and gallop across the kitchen, scattering blobs of mud. Just so, an editor’s remarks may obliterate the clean lines of the prose beneath, showing a blissful disregard for the meaning of a sentence or an essay. When the dogs dig up my flowers, I remind myself that they are creatures of ancient instinct, unlikely to change their ways. I could yell at them and call my anger “training,” or put up more fences to make their world even smaller. But a Westie’s nature includes stubborn persistence; their ancestors dragged Scottish badgers out of their dens. The same persistence serves a writer, or an editor, well in the long, long life that writing requires. I also remember my father saying, when we couldn’t corral a difficult bovine, “It pays to be smarter than the cow.” If I cannot bear to lose the flowers, I move them to a part of the yard where the dogs do not go. Similarly, when an editor misses a point, I no longer attempt to explain. I rephrase the idea, tucking it in somewhere else. Like the dogs, the editor may be so busy admiring or dozing in the hole he’s dug, he’ll never notice. The dogs snap at each other when they disagree over who sits on my lap, whose treat is larger, and for a dozen other reasons, but they sleep piled together. Similarly, editors display jealousy and distrust until a writer gets famous; then all of them use the same phrases to sell the next three or a dozen books by that author or a half dozen others. The Westies are pretty ferocious when a Rottweiler strolls past, as long as they are safe behind their chain link fence. Editors talking to writers from their own offices make a lot of racket and a lot of promises. When a writer is inside that office, the noise level drops precipitously. So living with the Westies has taught me to lower my expectations about editors. The dogs, for example, aren’t wise enough to be afraid of cars, so I keep my instructions simple. “No!” I bellow at street corners. When an editor told me to take the women out of one of my books, I used the same word at roughly the same volume. I hear he is now editing something on the Internet, not books. If I speak harshly to the dogs after they have misbehaved, their ears droop. But their attention spans are short. When an editor demanded changes I couldn’t stomach, I gritted my teeth and inserted them. Then I deleted them when I read the galley proofs. So far, he’s never noticed. Watching my dogs lick each other’s ears makes me wonder if the shortage of well-bred editors is coupled with the way male dogs attempt to establish dominance over one another. While I have not spent enough time in the company of editors to be an authority, I have noted that they seem to spend a lot of time whispering together at public gatherings. Their reasoning, I suppose, is that there’s no sense talking to writers, because fresh, naive ones are always available. When my dogs sniff each other’s private parts, I realize that they can’t help it. Their inbred behavior requires deportment completely alien to humans. Well, almost. A good editor will dig into your manuscript, uncover errors, and improve your writing. Still, all writers need good editors to polish their written words, so it’s important that we understand how we can help create the editors we need. As all owners should understand, a dog’s most annoying behavior is likely to have been caused by the way humans have treated him. Editors, too, are abused not only by writers who should know better, but by the reading public. Just as a canine’s feelings are easily hurt, and an apology may not restore its confidence, so it is with editors. I’ve seen no obedience school inviting writers to bring editors, properly leashed, for remedial training, but let me carry this comparison one more step. Dogs learn best when they are handled with patience and rewarded with affection. A beloved and respected canine is capable of a loyalty we humans rarely find elsewhere. So pay attention to editors. Take time to thank them for catching the errors you missed. Remember, a good editor’s labor improves your writing– and therefore your income, and your joy in life. 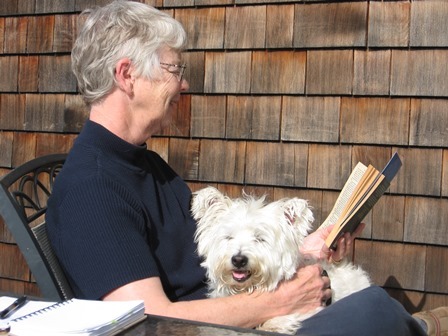 The satisfaction you’ll derive when a good editor understands and improves the point you were trying to make is nearly as good as snuggling with your favorite Westie during a blizzard. I have no idea what I answered, or how the interview ended, but I revised the manuscript as she suggested, taking out elements she suggested omitting. After several months she rejected it again, and this time she suggested adding some of the material she had suggested I take out, making clear she had no recollection of her original suggestions. At that point I resolved to stop submitting manuscripts to New York editors, and turned to regional publishers who might be more familiar with the ideas and attitudes of the West, as well as with my writing. That book was subsequently published by the University of Nevada Press in 1999, but not without more rejections, revisions, and discussions. And I was cynical about the get-rich-quick writing schemes that were beginning to flood the market: How to Write a Best-Seller from someone who never had done so, for example. But because I am a teacher at heart, the essay is not just cynicism; it’s full of suggestions about useful references, and includes good advice about dealing with editors. Far too many writers get angry at editorial advice and resolve never to send that editor another word. In so doing, they may lose the help of someone who could have helped them become a far better writer. 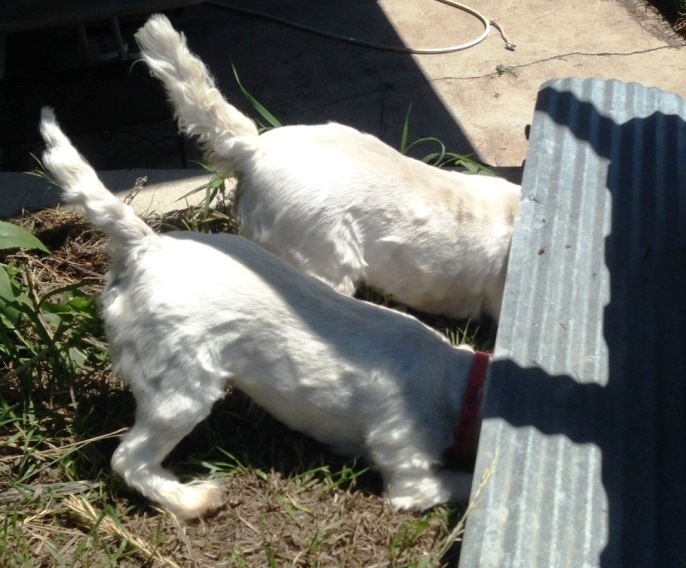 I enjoyed sly digs like my reference to being smarter than the cow, but once I hit on the dog comparison– no doubt because my then-Westies Mac and Duggan were staring at me from beside my desk– I felt I’d found the perfect vehicle for humor.